One of the credit cards eliciting the most buzz these days is the American Express Blue Cash. So it inspires us to look closer and find out more about its features, what users like about it, and even what makes some people think it needs a bit more work to gain their full acceptance. One of the most attractive offers made by credit cards is the no annual fee, and this happens to be one of the features of the Amex Blue Cash. Cash backs are also popular with users, encouraging them to use the cards on business establishments that have tie-ups with Amex. In line with this, the Blue Cash offers cash backs of 3% for the first $6,000 spent on US supermarkets; beyond the limit, the cash back reverts to only 1%. Amex Blue Cash also offers 2% cash back on all gas stations, 2% cash back at select department stores, and 1% cash back on all other purchases. 0% APR on purchases and balance transfers for the first 15 months, as long as your credit rating remains good and you don’t miss any payment dates. Balance transfers need to be within 30 days of opening the account. A bonus of $50 and free one year subscription to Amazon Prime is given. However, this is subject to spending at least $1,000 within the first three months of card membership. APR ranges from 12.99% to 21.99%, depending on your credit worthiness and other factors, including the prime rate. A penalty APR of 27.24% will be levied for a minimum period of six months in cases of late payments and returned payments. Late payments also nullify the 0% APR for the first 15 months offer. A charge of $5 or 3% of the amount of each transfer, whichever is greater, is levied on balance transfers. The same $5 minimum or 3% of cash advance amount applies to each instance of cash advance. Interest is being charged for balances not settled 25 days after the billing period. People like the offer of 0% interest for the first 15 months of use, which is the longest no interest offer of any credit card company. They are also attracted to the no annual payment fee feature. People are excited about the cash backs, being impressed by the 3% rate on supermarket purchases. They like the continuous 2% cash back on gas station purchases. However, the 1% cash back on other purchases is regarded as almost standard among credit card companies. People are generally impressed with the service provided by its customer service, which most rate as anywhere from good to excellent. People are also attracted by the $50 bonus, as well as, the free one year subscription to Amazon Prime for new accounts. Some people dislike the circuitous way of redeeming cash backs. The one month delay in billing is already a sore point, but redeeming the cash backs only through rewards dollars is the biggest reason for dissatisfaction with cash backs. There are also quite a few people who resent the rule that cash backs can only be redeemed in multiples of $25. People dislike paying interest rates that are higher than those charged by most other credit card companies. While interest can be avoided by paying bills promptly, people will wonder why Amex charges more. There are also those who resent charges on foreign transactions, with some saying the Amex Blue Cash would rate high on their list if not for it. Some dislike the $6000 maximum supermarket purchase limit where a 3% cash back applies. They feel the limit is too low. There are also complaints that purchases from some major retailers like Walmart, K-Mart and Target do not qualify for the 3% supermarket cash backs. With its innovative offers, many people are understandably attracted to the American Express Blue Cash. For one, the aesthetics of the card itself is much better than other competing cards on the market. As far as services are concerned, there are few complaints about customer service and credit card security, meaning it operates on a stable platform. The higher than usual interest rates is not a major disadvantage as it can be mitigated by prompt bill payments, which would reduce interest payments to zero. Its major failing, if we can call it that, is the much greater acceptability of rival Master and Visa cards. 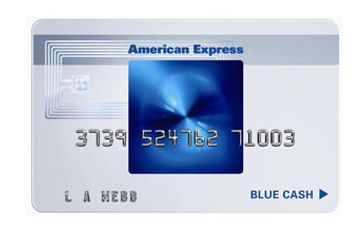 The American Express Blue Cash is a good second card for everyday use.